The Dales are a vast area of Thedas located southeastern of Orlais to the west of Ferelden and it used to be the homeland of the elven race. BioWare has recently confirmed this territory as an integrant part of the Inquisition’s main maps. However, it’s not known yet if the whole land will be featured in the upcoming game, since only one zone has been unveiled so far – the Exalted Planes. This zone is particularly rich in history and it has been a ceaseless battlefield over the centuries. Blood is yet to be shed once again as the Orlesian Civil War spreads across the land. The elves have a long history of slavery under the supremacy of the Tevinter Imperium but everything changed when they sided with Andraste and Maferath against the slavers. As a reward for their great service, the elves received an extensive land, the Dales, where they could revive their ancient civilization. Elven individuals all over Thedas tried to reach the Dales with just one goal in mind – freedom. United, the race founded Halamshiral, which means “the end of the journey” in Elvish and restored most of their ancient culture. However, peace didn’t last long and with the arrival of the Second Blight, the elves decided to cut off all the bounds with their human neighbours, more specifically Orlais. They remained neutral and watched from far away, while millions of humans perished to the darkspawn. Due to this, the hostility levels between the two races went out of control and war became inevitable. It’s not known what evidently triggered the war since each race has its own version of the events. Nonetheless, Orlais declared holy war against the elves and they’ve successfully taken over the land by force. Furthermore, the elves were forbidden to worship their gods or follow their culture. Those who embraced the Maker were sent to human cities to live in the slums known as alienages. Those who refused the Chantry’s offerings were either killed or exiled into small Dalish clans. Now, the Dales are an Orlesian colony and the Exalted Planes are the main stage of civil war, where human soldiers fight and die in the name of a future free of injustice and oppression. The Exalted Plains will foretell its own history through interactive and dynamic features. Players won’t need to read much in order to understand what’s going on in that specific land. After all, one image is worth more than a thousand words. 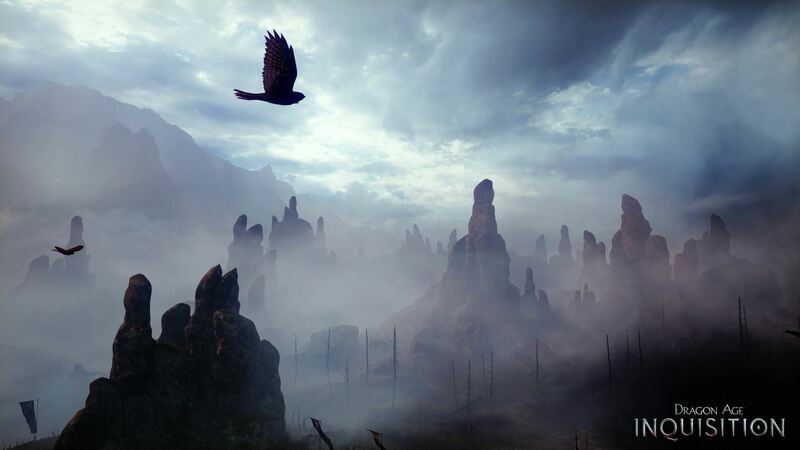 And that’s exactly BioWare’s goal in Inquisition, to create a new level of environmental realism. Utilizing Frostbite 3 game engine and next-generation technology, the company is now able to create a deeper and more immersive reality with life of its own. It’s not enough to be alive; the game has to be able to live as well. Now, it’s already known that Inquisition will feature a more intense choice-driven system, in which characters and factions will behave differently according to player’s decisions. This concept by itself will certainly increase the immersion and engagement levels of the game. However, to create an augmented environmental reality, other elements must be considered. 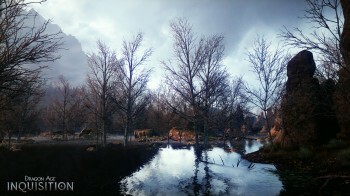 Displacement mapping and interactive waters are two of the advanced techniques being used by BioWare to achieve this new level of environmental realism. The essence seems to rely on the replication of the world around us – every detail counts. 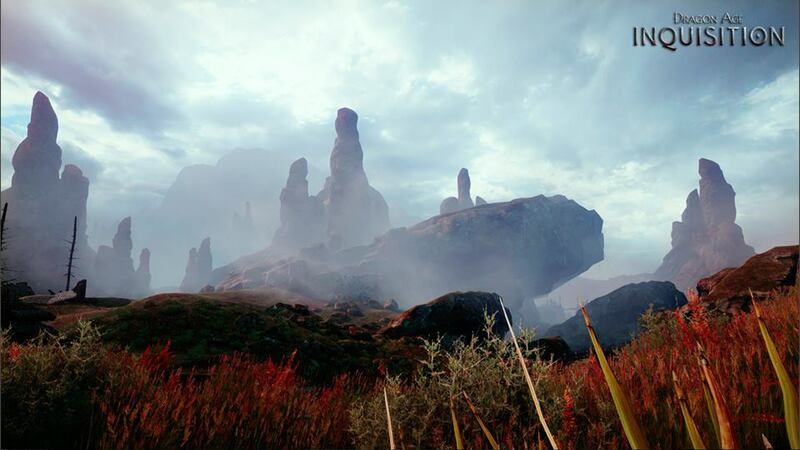 Exploration has always been part of the Dragon Age series but apparently, this system is about to become really complex and challenging. Getting off the main roads and look around might be a good idea at certain times, at least there will be a good chance to discover something unexpected. Who knows what kind of things you’ll be able to find in Inquisition? In the previous games, companion gifts and lore items were the most surprising findings. But in Inquisition there will be much more to explore, which might indicate that there will be much more to discover as well.